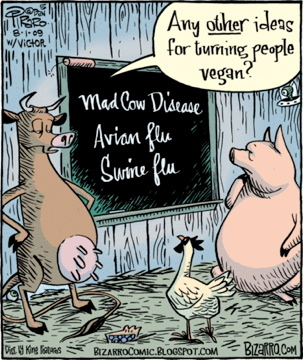 Most vegans are well-acquainted with Dan Piraro's work, and when I stumbled upon this brilliant cartoon again the other day, I had to share the laugh. I don't think I see the comic! Can you link it again? I clicked the Piraro and just spent and hour browsing the site! Love his stuff! Sonia, the link was broken somehow, but thx, back up. I'm with you, I'm very fond of his work too! Still no image. The URL is corrupt. Thanks Scott. Tried another way to upload. The image appeared initially, but not after - ? - thanks for the assistance. I just adore Dan's stuff. Who says vegans can't be sassy & funny! Love the one where the gal says now she just throws red wine on people who wear fur. I love this post - really funny!